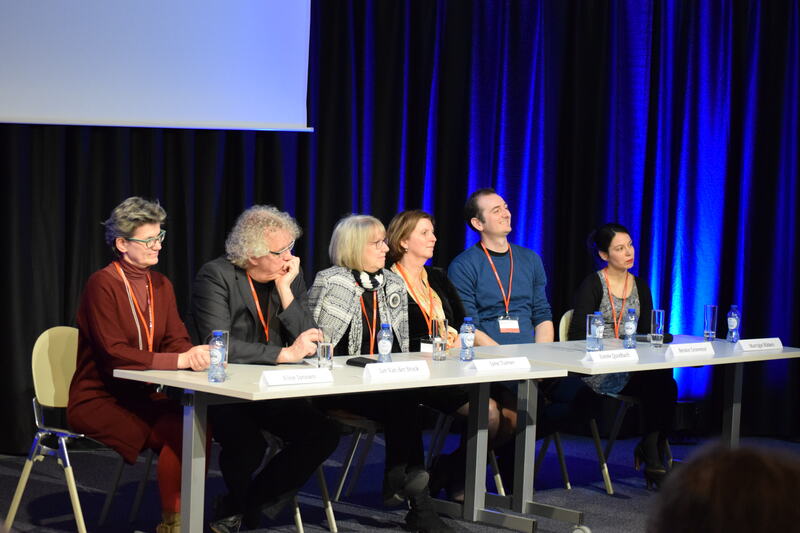 Speakers of CODART 21 (from left to right) : Elsje Janssen, Jan Van Der Stock, Jane Turner, Esmée Quodbach, Bendor Grosvenor, and Marrigje Rikken. Many countries invest large sums of money in – and make profit from – the extraction of natural resources, such as oil and precious minerals. For Belgium, and for Europe as a whole, it makes sense to equally regard “fine art” as an indispensable natural resource. This precious material, which is not inexhaustible, should not merely be consumed receptively, with a view to entice large numbers of tourists. Museums should not pursue a superficial approach, treating exhibitions as pure consumer items. It is unacceptable to subject our limited cultural resources to ruthless commercial exploitation. We all share a responsibility for treating them with care. Research in the fields of art history and art and technology can make significant contributions here. Museums frequently reach out to academics for assistance in preparing exhibitions or performing the technological analysis of artefacts. Close collaboration between the internal expertise of museums and the external input of universities usually produces exciting results. In Leuven, the partnership between M–Museum Leuven, the Catholic University of Leuven, and the municipality of Leuven gave rise to a structural platform in the form of “KU[n]ST Leuven,” an organization that sets up city-wide projects every two years, each one centring on an exhibition displaying international loans. Illuminare’s exhibitions, whether in Belgian museums or elsewhere (Antwerp, Brussels, Florence, Leuven, Paris, and St. Petersburg) are all inspired by fundamental research by a team of – often young – researchers in partnership with more experienced art historians and curators. This makes it possible to free up more research resources for the substantive preparation of innovative exhibitions geared towards an international general public. Partnerships between universities and museums also benefit young art historians. Flemish and European collections offer interesting internship opportunities for our students, and the collections are rich in subjects that lend themselves to applied research. Jan Van der Stock is a Belgian art historian and exhibition curator. He is full professor at the University of Leuven, where he lectures on Medieval and Renaissance Arts, Graphic Arts, Iconography, Iconology, and Curatorship. He is the director of Illuminare, Centre for the Study of Medieval Art (University of Leuven) and holder of the Van der Weyden Chair – Paul & Dora Janssen, the Veronique Vandekerchove Chair of the City of Leuven, and the Chair of Medieval Sculpture in the Low Countries. In 1995 Van der Stock received his PhD from the University of Leuven presenting a dissertation on the development of the printed image in the Low Countries of the fifteenth and sixteenth centuries. Since then he has published widely on the subject. In 1999 he became Professor, by special appointment, of Prints and Drawings at Leiden University. From 1998 to 2000 Van der Stock held the post of assistant curator in the Print Room of the Royal Library of Belgium, Brussels, and since 2000 he has been a full-time member of the Faculty of Arts at the University of Leuven. Since 2005 he has been a member of the Royal Flemish Academy of Belgium for Science and the Arts. He is currently completing the book Between Norm and Practice. Two Centuries of Painting and Sculpture in Antwerp, Mid-14th – mid-16th Centuries: Assessing the Archival Evidence. Jan Van der Stock has organized several international exhibitions, the most recent of which was the exhibition In Search of Utopia (2016), at M-Museum, Leuven.